Packed inside the even lighter and 24 per cent more rigid evolution of the aluminium Audi Space Frame (ASF) which forms the 'skeleton' of the new A8 are myriad new technological advances. These of course include fundamentals such as economy and emissions advantages for the three significantly reworked FSI and TDI engines that will be available from launch - the 3.0-litre V6 TDI with 250PS and 550Nm of torque (up from 233PS and 450Nm), the 4.2-litre V8 TDI with 350PS and 800Nm (up from 326PS and 650Nm) and the 4.2-litre V8 FSI with 372PS and 445Nm (up from 350PS and 440Nm). This advanced transmission can also 'talk' to the new, next generation MMI Touch in-car infotainment system, networking with the detailed route data supplied by its inbuilt navigation system to factor corners into its gearshift strategy and avoid unnecessary, fuel-sapping gear changes. The state-of-the-art adaptive cruise control and adaptive light swivelling cornering light systems are also influenced by feedback from the navigation unit. In its standard form the pre-sense system analyzes the information from the ESP sensors. When they signal maximum brake application or skidding, the control unit intervenes. Depending on the situation, it activates the hazard warning lights and closes the side windows and the sunroof; it also tensions the front seat belts. Electric motors trigger this process, which is reversible - if the situation ends well, the belts are released again. Working with Adaptive Cruise Control stop & go, Audi pre-sense front monitors the traffic in front of the new Audi A8 and supports the driver in multiple stages. The first is a warning signal, and the second a warning jerk in the form of a brief deceleration. If the driver now depresses the pedal, the brake assist system initiates precise braking relative to the preceding vehicle. If the driver remains passive, the third stage follows - autonomous partial braking that slows the A8 at a rate of 3 m/s2. Windows and the sunroof are closed, the hazard warning lights are activated and the seat belts are tensioned. In this safe haven, A8 passengers are surrounded by high-quality workmanship showing attention to the smallest detail, and of course the leading edge technology that defines the Vorsprung durch Technik brand. Swathed in supple Valcona leather, shielded from the elements by double glazing and bathed in soothing LED ambient lighting the interior's highlights include the Audi Parking System Plus, DAB digital radio, four-zone climate control, Audi Music Interface iPod connection, MMI Touch infotainment incorporating HDD satellite navigation with predictive route technology, cruise control and a keyless go system. 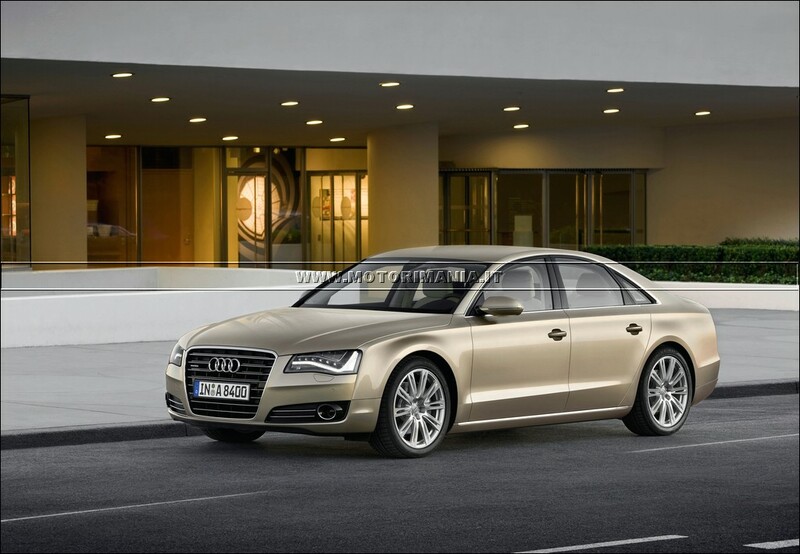 Two specification levels will be available to UK A8 customers - SE and SE Executive - the latter adding to this equipment list features such as electrically operated boot closing, the Audi Parking System Advanced with rear parking camera and larger 19-inch wheels in place of the 18-inch design fitted to SE models.